The abdominal wall consists primarily of the outer abdominal muscles, including the rectus abdominis and the external obliques. Although traditional ab exercises, such as sit-ups and twisting crunches, strengthen the structure of these muscles, they provide very little benefit for the daily activities and sports that require your body to move and produce force in different directions, for example, pushing, running and throwing. A Pennsylvania State University study published in "Journal of Strength and Conditioning Research" in March 2013 showed that exercises incorporating the shoulders and buttocks improve strength, endurance and stability more than just doing regular abdominal exercises alone. A better way to strengthen your abdominal wall is to perform full-body exercises. Stand with your feet about shoulder-distance apart with your feet pointing forward or slightly out to the sides. Hold a medicine ball with both hands in front of your chest with arms slightly bent. Inhale as you swing the ball up over your head while extending your torso and hips slightly. Exhale as you swing the ball down and in between your legs without hunching your back and shoulders. Bend your legs slightly as you swing forward. Repeat the exercises as fast as you can for eight to 10 reps.
Start in the same position as in step one. Swing the medicine ball horizontally to your right, turning your torso, left hip and left foot at the same time. Keep your right foot planted on the floor. Swing the ball across your body horizontally to your left, turning your torso, right hip and right foot together. Perform 10 to 20 rotations while maintaining a steady breathing rhythm. Stand with your feet about shoulder-distance apart and hold the medicine ball over your right shoulder with both hands, turning your torso slightly to the left. Exhale as you swing the ball diagonally across your body toward your left hip. Turn your torso as you swing. Inhale as you bring the ball over your right shoulder, and repeat the exercise as fast as you can. Perform eight to 10 reps on each side of your body. Rest for one minute and repeat the workout one or two more times. 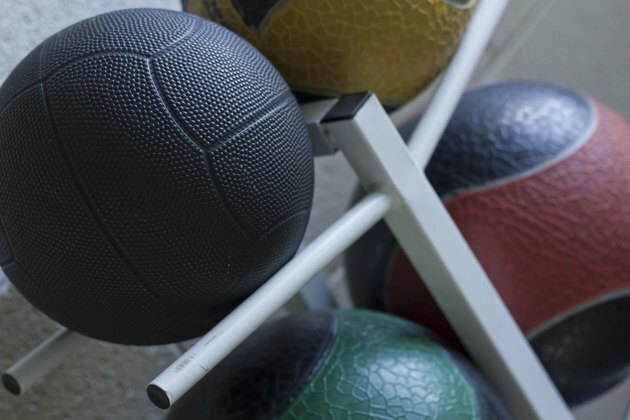 Use a heavier or lighter ball if you want to adjust the difficulty. Stand with your right foot about one foot in front of you, and hold a dumbbell in each hand over and near your shoulders. Keep your elbows close to your ribs, and point them forward. Your knuckles should be facing out to your sides. Keep your back straight and your legs slightly bent throughout the exercise. Exhale as you press the dumbbells over your head until your arms are straight without hyperextending your spine or shrugging your shoulders. Inhale as you lower the weights back to the starting position. Perform eight to 10 reps. Stand about five to six feet away from a sturdy wall with your feet about hip-distance apart. Hold a medicine ball with both hands near your chest. Bend your legs slightly, and keep your back straight. Exhale as you throw the ball at the wall by quickly extending your arms forward like you were passing a basketball. Extend your legs quickly as you throw to help generate force. Catch the ball after it bounces off the wall once. Repeat the exercise as fast as you can for 10 to 20 reps. Use a heavier medicine ball or increase the distance between you and the wall if you wish to increase the difficulty. Use a lighter ball or decrease the distance if you want to make the exercise easier. Stand on top of a plyometric box that is about two-to-three-feet high with your feet slightly apart. Hop down to the floor, and land gently on your toes and the balls of your feet by bending your legs and hips. Jump straight up immediately and swing your arms overhead at the same time like a volleyball player. Extend your hips, knees and ankles as you jump. Jump on top of the box and repeat the exercise five to 10 times. Rest for one to two minutes, and repeat the circuit two to three more times. Researchers from University of Tokyo revealed in an August 2011 issue of "Journal of Electromyography & Kinesiology" that after jumping off an elevated platform, the rectus abdominis and external obliques activate about 100 milliseconds before landing on the floor with the feet. These muscles continue to stay activated throughout the landing sequence. Thus, any high-impact exercises, such as vertical jumps, lateral bounds, jump-rope exercises and sprinting will strengthen your abdominal wall. Likewise, any exercises that require swinging, throwing, pushing or pulling from a standing position will engage your abdominal muscles. Sample exercises include standing cable rows, overhead medicine ball throws, kettlebell swings and push-ups. See your doctor or healthcare provider immediately if you experience pain in your back, hips or abdominal region when you exercise. Work with a qualified exercise professional for a few weeks if you're new to strength and power conditioning before training on your own.